Technical analysis provider Autochartist has announced the launch of ‘Our Favorites’. Based on the company’s existing technical analysis product for spotting emerging chart patterns, the Our Favorites offering allows users to filter trade setups based on historical success of each pattern. Screening can be applied based on asset type and between 60-80% success rates. 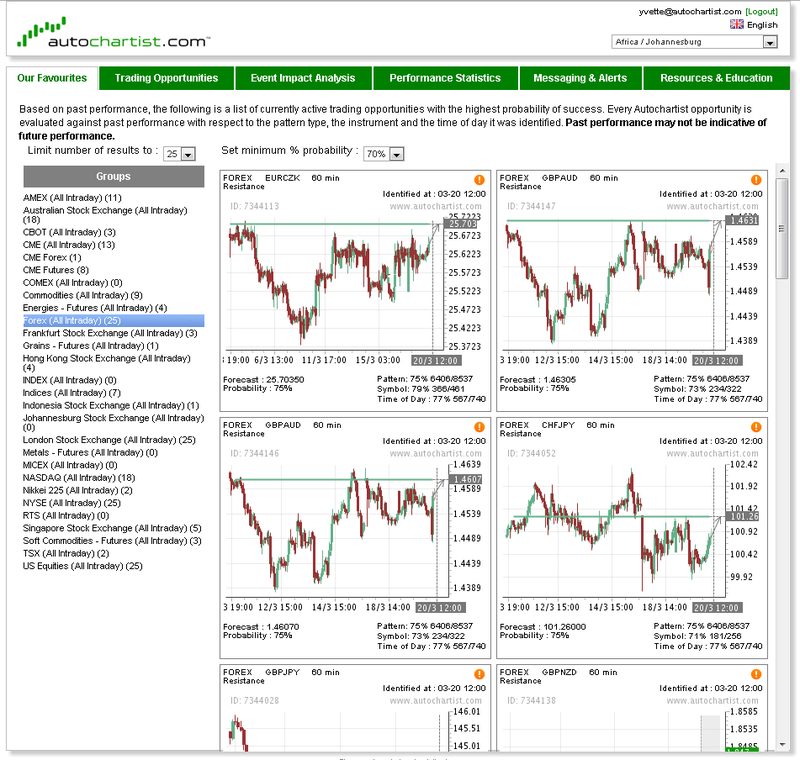 Results are provided on one screen along with the chart that shows the emerging pattern, forecast, and probability percentages for the trade. The product is currently being rolled out to direct Autochartist users with availability across the broker network coming soon. While not a true signal provider, Autochartist’s analysis is slowly moving from just chart reading to producing trade ideas. As such, although it isn’t in their current plans to produce copy/signal trading for users, it will be interesting to see if a third party product will get created based on the Autochartist analysis now that they have added probability percentages. March 21st, 2013 – Autochartist, the award-winning provider of automated technical analysis solutions, has today announced the launch of its revolutionary ‘Our Favourites’ trade alert service. Presenting clients with the trades Autochartist calculates to be statistically most successful in a single view, the service offers a brand new approach to technical analysis. Technical analysis has historically been seen as hugely complicated with traders having to study a single chart for each asset over multiple time frames in the hope of identifying an emerging pattern. However, the Autochartist service has successfully automated this process and since 2004, over 40 of the world’s leading brokers have adopted the technology. Our Favourites is the latest refinement, presenting clients with the trades deemed statistically most likely to be profitable, all in a single view. Clients can select the desired minimum probability of success – from 60% to 80% – and each trade opportunity is then highlighted. A graphical illustration, plus details of the system’s historical success of forecasting against the specific pattern, on that asset and at that time of day are also given. Our Favourites is currently available to all direct users of Autochartist, and the service will be rolled out across the broker network in due course. Autochartist was founded in 2004 and has partnered with many leading brokerage firms across the globe in Forex, CFDs, equities and commodities. Autochartist currently services more than 50 000 traders in over 80 countries worldwide, and delivers in excess of 400 000 trade opportunities per month. Committed to service excellence, tailoring solutions for particular clients, and never slowing down with developing innovative new products that deliver high-quality, actionable trade opportunities, Autochartist is the market leader in automated technical analysis. ” To uniquely identify markets, including market segments where it is appropriate to distinguish between lit and dark order books.” Can you elaborate on ‘lit and dark order books’ please?